As we noted in part one Unlocking Next-Generation Value through Technology-Embedded Business Process Services | Part 1 The What and Why of this two-part report, the global business environment is experiencing major shifts as a result of combined economic, demographic, regulatory, and technological changes. Business Process Services (BPS) is caught up in the mix as these shifts disrupt existing business models and create new ones. Organizations expect their BPS initiatives to result in greater agility and speed, as well as to drive business outcomes, all on top of the traditional operational cost savings and efficiency. Contact centers across the world are moving into the digital era with focus on enhanced customer experience in a multi-channel environment. This industry-wide change has led to service providers changing their value proposition from traditional FTE-based business to technology enabled solutions such as automation and analytics in order to stay relevant. With the market going through a period of transition, the global CCO market grew at a rate of 4% in 2015 to reach US$75-78 billion. The changing landscape of the buyer requirements and evolving consumer needs for multi-channel digital experience has had an impact on the solution characteristics that exist in the CCO market currently – higher onshore delivery, multi-channel solutions, technology, automation solutions, value-added services, technology, and pricing model. Today robots pick-pack boxes in warehouses; assemble varied objects as small and delicate as smartphones and as large and complex as aircraft engines. Automation is making rapid inroads into IT and business processes, transforming human to system and system to system interactions. This raises a pertinent question for customers-why outsource when you can automate to get the cost advantage? Intelligent automation presents itself as the best-suited solution for majority of rules-driven processes being outsourced today (infrastructure management or IM, business process management or BPM and application management and testing) – redefining the offshoring versus on-shoring debate. 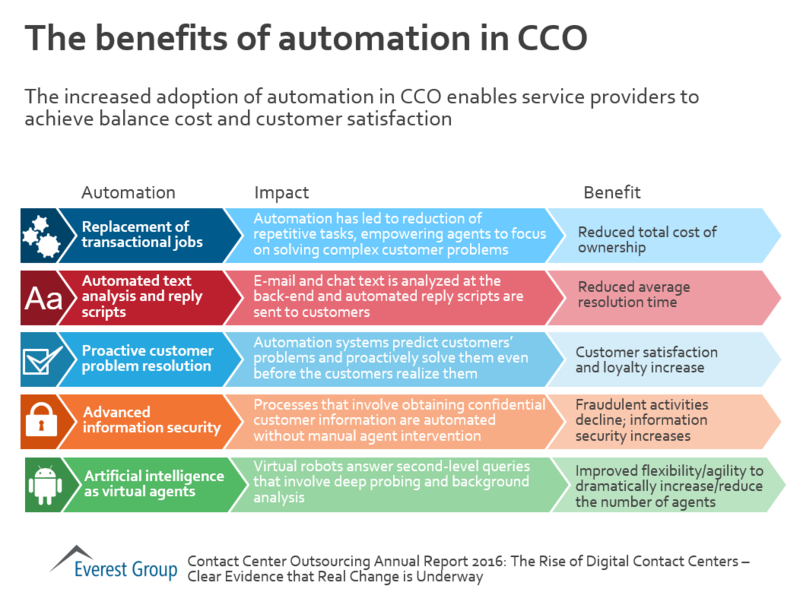 While there is a scope to bring down the headcount by over 50% and reduce costs up to 70% in an optimally automated IM contract, automation also poses a dilemma for enterprises–adopt a cost-effective automation fix to solve technology problems or choose an end-to-end automation solution which may require a higher upfront investment? Robotic process automation and artificial intelligence (AI) are poised to redefine IT-BPM industry. Robotics has played a pivotal role in transforming the shop floor and assembly lines in the manufacturing sector. Now, software robotics is gaining traction across healthcare, insurance, banking and BPM industries. Robots can automate workload of 1.5-2 full time equivalent (FTEs) jobs in IT-BPM industry and still generate net saving of $10,000 per job i.e. work delivered by 2 FTEs at a cost of $40,000 can be performed by a robot, generating net savings of $20,000 by year two of deployment. Similarly, the AI technology has come a long way since 1997, when an intelligent machine defeated the world chess champion. Sophisticated robotic traders powered by AI techniques dominate the present-day stock exchanges, accounting for 70% of transactions in the US. AI applications will become pervasive across industries with evolving self-learning capabilities to further improve productivity . While there has been a lot of rhetoric around the threat posed by automation to the traditional IT outsourcing model; it also presents an opportunity. As automation adds 10-20% cost savings beyond what offshoring already provides, enterprises will deploy saved IT budgets on other innovative technologies. Such a trend has been observed in the past when lower offshore billing rates enabled enterprises to reduce their IT costs significantly while IT services spen ding continued to soar (2003-08, 2010-12). That said, recent initiatives by Indian IT services providers vindicate that they saw this coming, and are taking a lead in innovation. Majority of the players have launched their automation platforms, made acquisitions, set up separate digital units and established partner and startup ecosystems. Service provider (SP) initiatives are moving beyond automation-friendly services to nontraditional customer-facing enterprise applications to offer efficiency and cost benefits. For instance, AI platform of a tier-I Indian IT services player uses machine learning algorithms to create digital virtual agents for next-generation customer services solutions. Advances in intelligent automation are ushering in a gradual shift from people-centric to technology-centric business models-debunking the idea that technological expertise of an enterprise is directly linked to its headcount. In April 2012, a photo-sharing startup, employing 13 people, was acquired for $1 billion – giving it a valuation of ~$77 million/employee. Fast-forward two years, an over-the-top messaging company, which employed 55 people, was acquired for $19 billion ~$345 millionemployee. Automation technology applications have so far barely seen the tip of the iceberg. Indian SPs should not fall prey to short-sighted approach that views automation cannibalising their existing revenue streams. Unlike the software product industry, automation product landscape does not have globally recognised brands. This is a unique opportunity for Indian SPs to build indigenous platforms and products and dominate this space. There is a wide held belief that while automation may disrupt jobs and businesses across industries, it will also fuel the demand for holistic SPs who can help clients with long-term solutions (product architecture and application design) as well as medium-term productivity enhancements through intelligent automation. The total value of traditional IT outsourcing contracts in Europe fell in the second three months of 2016, but IT as a service contracts saw significant growth. The entire contract value in the Europe, Middle East and Africa region, taking into account deals worth €4m and more, was €2.2bn – 18% less than the same period a year ago. At €1.2bn traditional IT and business processing outsourcing was down 28% in the second quarter of 2016, compared to the same period in 2016, according to the latest figures from ISG. In contrast, IT as a service total contract value in the region jumped 38% to €600m. “The region’s traditional sourcing markets pulled back in the second quarter and came in at lower levels than projected, due to a lack of large deals and restructurings, alongside some challenging macro-economic factors inside the European Union,” said John Keppel, president at ISG. As-a-service all-commodity volume growth is being driven by infrastructure-as-a-service (IaaS) activity, with total contract value rising 63%. Software as a service (SaaS) increased by 9% in the same period. The sale of as-a-service contracts could be part of the reason that the value of traditional IT outsourcing contracts is falling. The amount of money UK organisations spent on IT and business process outsourcing fell sharply in 2015, compared to the previous year. A lull in UK outsourcing activity in the run-up to the election caused a 25% drop in spending across the Emea region in Q1 2015, claims ISG. A report from sourcing advisor, Information Services Group, has reported a decline in the value of contracts during 2013. SaaS is well established with companies such as Salesforce.com, Microsoft and Oracle all offering their software through the cloud with subscription models. The IaaS market is seeing significant growth with the likes of Amazon Web Services and Microsoft, through Azure, winning contracts with customers of different shapes and sizes. The ability to pay for computing resources when you need them, without up-front capital costs, is driving the adoption of IaaS. I’m sure you’ve heard the adage that one of the keys to investing is diversification. Well, the same can be said for outsourcing. The three types of outsourcing – nearshore, offshore and onshore – all have specific benefits and each option is typically associated with expertise in certain skill sets based on the training available in that geography. A hybrid solution encompassing a variety of these outsourcing options can often provide you with the most optimal solution to align your company’s needs and goals with that of your outsourcing provider, while minimizing your cost outlay. Valor views hybrid outsourcing as a best-sourcing model made up of the best combination of offshore, nearshore and onshore resources to best fit your specific needs and budget. Low Cost – In addition to the traditional cost-saving benefits of outsourcing – such as eliminating costs of training, benefits and overhead – optimizing your mix of geographies and skill sets can help you improve operational efficiency and lower your costs. Increased Effectiveness – Best sourcing matches cultural compatibility, skilled labor and cost requirements to align with your company’s specific goals and create the highest levels of productivity. Scalability of On-Demand Labor – Utilizing a hybrid model provides maximum uptime and scalability – helping you extend your workday between multiple global locations. By eliminating capacity, location or time zone constraints, you are equipped with a virtual, on-demand labor force. Single Source of Contact and Management – Having multiple, optimized outsourced locations doesn’t translate to more work and more management time on your behalf. Your outsourcing provider should provide a single source of contact to handle all the management, oversight and alignment between locations. Standardized Processes – The cost of optimizing processes is greatly reduced since the hybrid model utilizes the same optimized and standardized processes throughout all locations. Traditionally, outsourcing involved selecting the lowest cost location and many companies found themselves flying to many different locales to manage their portfolio of providers. The hybrid model gives you the same capabilities, optimized based on talent and cost, with just a single point of contact. An important consideration when looking for in a hybrid provider is that they employ a global methodology and framework for managing their clients, data, processes and employees. This provides consistency of experience throughout all locations and ensures the client will be able to easily scale and migrate resources to different locations as their needs change. While traditional offshore locals will likely dominate IT services outsourcing due to their extensive labor pool, established infrastructure and cost structures, many nearshore outsourcing centers have developed a high level of proficiency in customer care, English language and robust IT infrastructure. These locals are closer to the U.S., so they also provide greater cultural alignment which can be an important factor when customer interaction is involved. Onshore resources provide a high level of talent and exact cultural alignment, but often come at a slightly higher cost. The key to the hybrid model is finding an outsourcing partner that is tightly aligned with your core values and goals, and will work to match those goals with the best combination of resources. Source: ValorGlobal.com-What is Hybrid Outsourcing & Why Should You Care?